I could here the SPOING a thousand miles away! 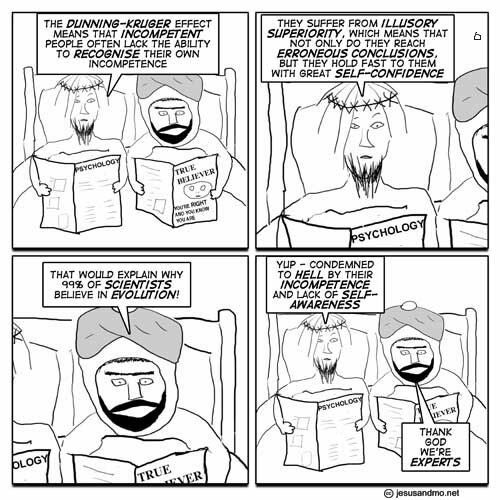 This explains why religious leaders often suffer from “illusory superiority”, but why are their followers unable to recognise the incompetence? Is extreme self-confidence in a leader enough to sway the faithful? Is it the power of divine retribution that keeps them cowed? Do they see the errors, but don’t dare say anything due to societal norms/peer pressure? Or are they just too lazy to think for themselves? Someday, I hope to meet up with that one percent of scientists that refuse to allow the facts to get in their way. I didn’t know that there were so many of them, this meeting could make a great comedy documentary, but only if I could get to them before Michael Moore does. Meta-Dunning! Do they know disappear in their own arses? Dunning-Kruger effect, eh? My friends will get tired of hearing about this. Thanks, Author! I thought they were going to say the barmaid rather than 99% of scientists. I remember reading about that. Some lies are essential, such as when placating higher ranking members or building alliances with peers. They are tools for good, as well as for bad. One of my daughters was so susceptible to this as a child, that she couldn’t back down from a denial once made, no matter how easily it could be refuted. Didn’t even matter if there were no significant consequences. I learned not to force that initial denial and just talk about the situation quietly. This is just another mechanism that has been appropriated by the helminth of religion to strengthen its parasitic hold on its hosts. Hey I said something like this once when commenting on a blog and got dismissed as elitist. I wasn’t talking in terms of incompetence though, I was talking in terms of general intelligence. I said that it takes an intelligent person to recognise an intelligent person . . . is that much different from the Dunning-Kruger effect? Isn’t the Meta-Dunning-Krueger effect, that people who actually are competent in one area, feel falsly immune to the Dunning-Krueger effect in other areas, with sometimes hilarious consequences. Like scientist talking about philosophy or religion. Allegedly, the conviction it couldn’t apply to you is the easiest symptom to identify it being at work. I think it is more along the lines of: it takes an intelligent person to recognize that they are not the highest form of intelligence. Below a certain amount of intelligence it seems so many people lose touch with reality and start living in their own “infallible” head. Cant hate people for being incapable of deciphering reality though, some people just dont have that option. So much of this thread reminds me of doublethink from “1984”. I am a long time reader of J and M and I love reading the comments but I never had the pull to join in on the conversation, but this comic is perfect and I had ta jump in. For some reason this one made me think of motorcycling. Riding a powered two wheeler is, up to a point, inherently dangerous and just about everyone who does it has had to go through a learning process which includes falling off occasionally. The point being that most of us learn from our mistakes, and though a spill can still happen to the best of us, I have now been riding for decades without coming a cropper (You just watch, it will probably happen tomorrow). However, there seems to be a minority of riders who, no matter how many times they crash their bike, still see themselves as being nearly as good as Rossi. They seem to be able to rationalise that it was not their fault and couldn’t be avoided and so they appear not to learn from it. Sorry if I’m a bit off topic. PfatBudz has a good point. I find myself increasingly “infallible”, as old-age starts to strip me of my intelligence. Any other old-timers noticed this? 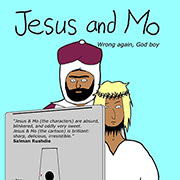 hey, there’s this webcomic I think you are guys will love: smbc-comics.com, its noy always about religion, but its (almost) always funny…today’s comic mocks te Fall of Humanity…its brilliant. I see this kind of thing all of the time. I am intelligent enough to know that even after all the reading, schooling, working, I know that there is a great deal I don’t know and many much more intelligent than I. The people I get a kick out of are those who think that they are intelligent but aren’t but still try to convince everyone that they are. They are worse than the ones who know that they aren’t all that smart, at least these types know who they are and that if they chose to could actually get more intelligent. I found this really cool word in the wikipedia page on DK effect – anosognosia. One of the points to raise here is that humans are inherently fallible thinkers. “Well, duh!” you might think- but that’s what makes scientific method so valuable. It is inherently self-correcting with a body of people who try to tear into ideas and force the thinking to be better. Its not a set of beliefs or a set of experts but an attitude and a public mechanism- ideas are tested by experiment. I therefore am uncomfortable with people who set themselves up to pronounce on what is good or bad in “science” generally- the tendency to assume that because you are competent in one area you will be so in another. I see what you mean, but I believe that the rigour of scientific training, the honing of one’s ideas through debate and peer review, and the general experience of life and the world that one has by the time one is old enough to be competent to pronounce on ‘science’ generally give one a degree of legitimacy. Richard Dawkins himself embraces many other disciplines in the God Delusion, and although he is not a qualified psychiatrist, sociologist, physicist, theologian, geologist or historian, I have no problem with him bringing the arguments from these schools of thought into his book. After all, it would be a pretty dull (not to mention short) book without them. Hey, you guys remember the “banana” joke from J&M?? you know “the banana is an atheist’s nightmare…”, well yesterday I found out something awesome: Bananas are product of artificial selction. You see, bananas are sterile, and depend on humans to reproduce. Furthermore, the yellow banana is actually a mutated plantain: In 1836 a Jamaican guy found a mutated tree among his plantains and discovered that this yellow plantain had a sweeter taste and didn’t need to be cooked. And there’s more: Plantains were also artificially selected: The wild banana is larger and not so “perfect-shaped”, and is full of seeds. It was after generations of selective breeding that the plantaint got to the stage we now know, and then a mutation resulted in the banana, being a positive mutation for the survival of the species, it was transmitted into the next generations. Ob J&M: I like Mo’s choice of reading material. Check out The Purpose of Purpose lecture Dawkins did recently. It’s on richarddawkins.net. He references the Ray Comfort clip and shows some history of the banana. I know I’m late to the party (I’ve been working my way up from 2005/6 and cant stop the urge to reply any more). Has anyone considered that the D-K Effect may be false because D. & K. are not so smart as they think they are because they are Dunning-Kruger Affected? Would that mean that the people D. & K. think are D-K fodder might actually be smarter than they self-estimate?